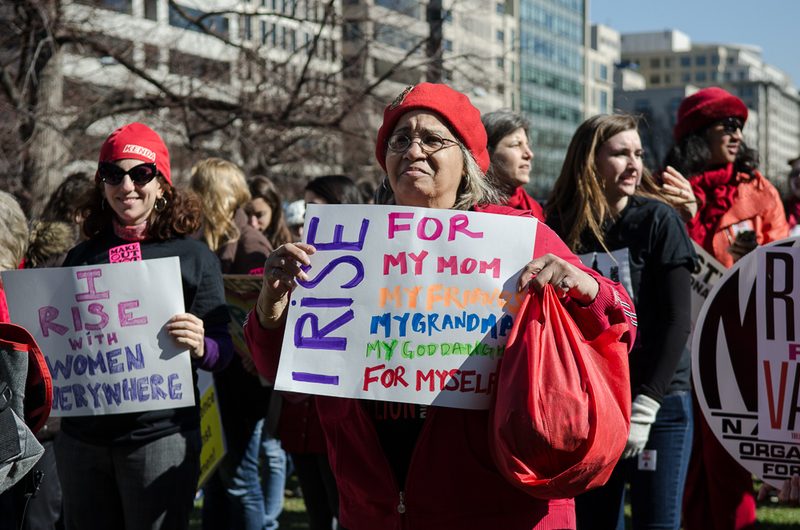 It seems fitting that today I got to stand in one of the central plazas in Washington, DC, just blocks from the White House, with hundreds of other women and men for One Billion Rising. 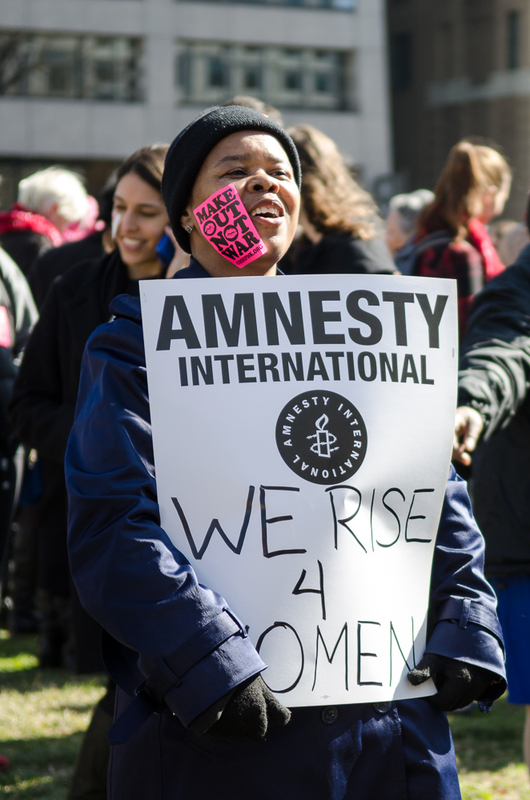 It was a global gathering of women (and those who love women) to rise against gender-based violence but also, according to the creators, to “dance and celebrate in defiance of its oppressive impact.” Defying the tragedy that exists for millions of women by moving bodies and voices in support of change. The event was part protest, part party, and even though it was just a few hundred people who stepped away from their desks at lunchtime, it was a statement of strength and solidarity. So powerful because women gathered today in nearly 200 countries, in their cities and towns and even in prisons. Halfway around the planet from where I was, thousands of women took to the streets in India, a country where more women and girls are subject to violence, abuse, exploitation and enslavement than anywhere else. Tomorrow I will board a flight to India to join Off the Mat, Into the World’s Bare Witness Tour, focusing our attention and intention on challenging the now global and multi-billion dollar industry that traffics and enslaves women and girls for sexual exploitation, arguably one of the most horrific forms of violence that exists in our world today. 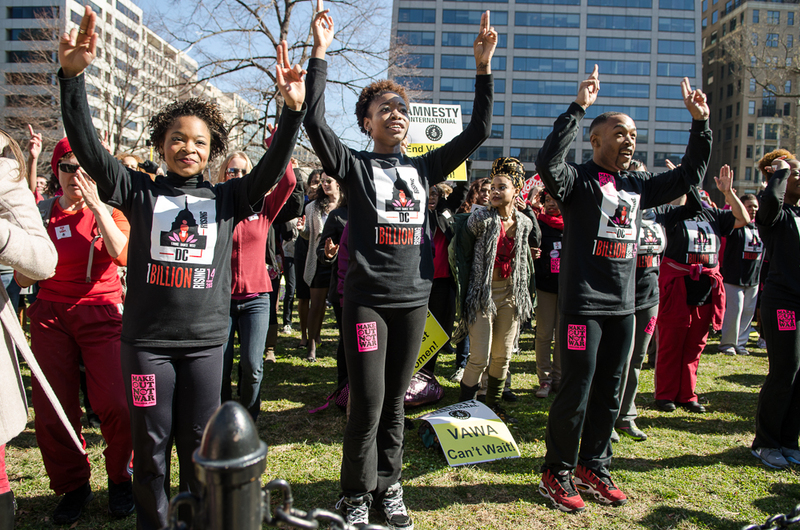 From our admittedly narrow vantage point in the nation’s capital, where the talk is often about minute details of policy and legislation, it can be hard to see the power of a group of people dancing in the street to send a message. But globally and through history, these are the types of small acts that have brought about big change. In my own experience, working with Off the Mat and with non-profits around the world, in Haiti, India and the US, I have begun to understand better the impact we can have coming together in community, on the street, in a capital or in our own neighborhood. This is ritual as activism, conveying a powerful message and drawing attention and awareness to that message in a way that simply standing up and talking about a cause will never be able to do. There was a moment when a women’s a cappella group was ready to begin singing on the stage and we heard blaring sirens close by and moving slowly, which in DC usually means a motorcade and even could have been the president, given our location. One of the singers suggested that we pause and let the sirens pass, but the crowd rumbled to life, sending up their voices so that the passing elected official could hear our message loud and clear. And in that moment, our voices merged with those of women in India who have been beaten by their husbands, viciously attacked by strangers as they walk down the street or sold by their own family members for less than what I spend on groceries each week. I am humbled by the opportunity and the responsibility to experience both the profound tragedy of violence that exists in Delhi and Kolkata, in Washington, DC, and in every community on the planet, but to also stand in a place that represents the great potential of this revolution to evoke meaningful change. At home I take for granted that my garbage moves through a well-planned system of collection, treatment and disposal, or recycling. It disappears from my curb and I rarely give it another thought, especially the oversized blue recycling bin that swallows the majority of our waste because my county recycles virtually every type of plastic, glass, metal and paper product. I assume it’s all carried away, processed locally and then sent off to be turned into new products. But in Haiti, where I’ve traveled twice in the past year, initially as part of Off the Mat, Into the World’s Global Seva Challenge project, I approach every single plastic water bottle with a sense of disdain. The streets are lined with thousands of these bottles, empty containers and wrappers, scraps of clothing, mismatched shoes and the remnants of lives discarded. There’s nowhere for it to go on this tiny, rugged island, but into another pile. And seeing garbage piled up everywhere I look breaks my heart. The children I have met on my trips play amidst the garbage, sometimes barefoot or in tattered sandals that spill off into the waste. Women sit behind curbside market stalls, surrounded by rotting food and containers that represent life lived without the stability of reusable wares. I am a visitor here, transitory and simply observing. It’s hard not to judge but then step back and really see people who are doing the best they can, truly living in the present moment because it’s all they have, survival as the sole focus. On our most recent trip in December, exploring the historic sites of Haiti’s north coast, we were horrified to see a colonial-era fort near Cap Haitien—a site that holds the power of the only successful slave rebellion in history—also swallowed in garbage. To get to the fort, we walked a once-sandy beach trail that had become a carpet of bottles and cans and discarded bits of everyday life. But this trail, and Haiti’s streets, are in fact lined with hope. 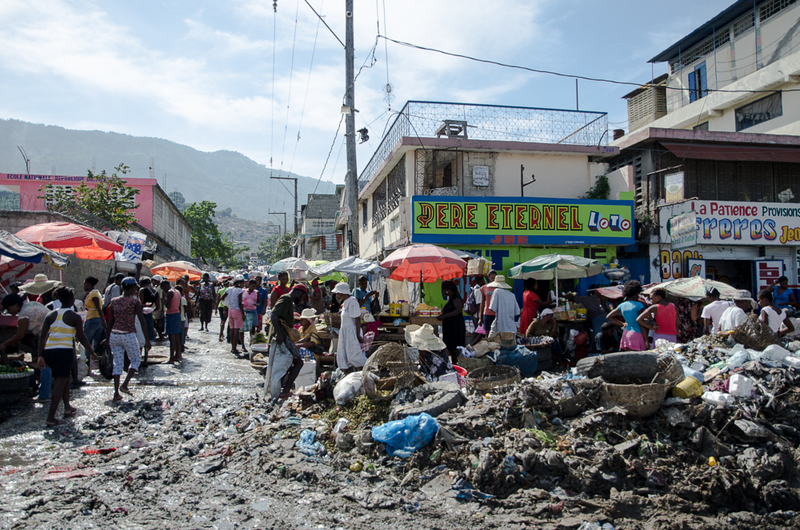 Perpetually recovering from centuries of unrest, disaster and poor governance, the effects of the massive 2010 earthquake still felt daily, Haiti presents in its moment of transition an opportunity for a more sustainable approach. Executives Without Borders and Haiti Recycling are partnering in a program called Ramase Lajan, which literally means “picking up money.” With the support of donors and organizations around the world, Ramase Lajan is establishing community-based recycling centers around Haiti. The model is one of sustainable development—a local Haitian is selected to manage the center, trained and given the funds to train and hire others. Everyone in the local community can get involved, collecting bottles and cans and selling them to the center as a means of income. The center then transports and sells the recyclables to Haiti Recycling, in Port-au-Prince, where they processed to be shipped abroad for recycling and for use in new products. 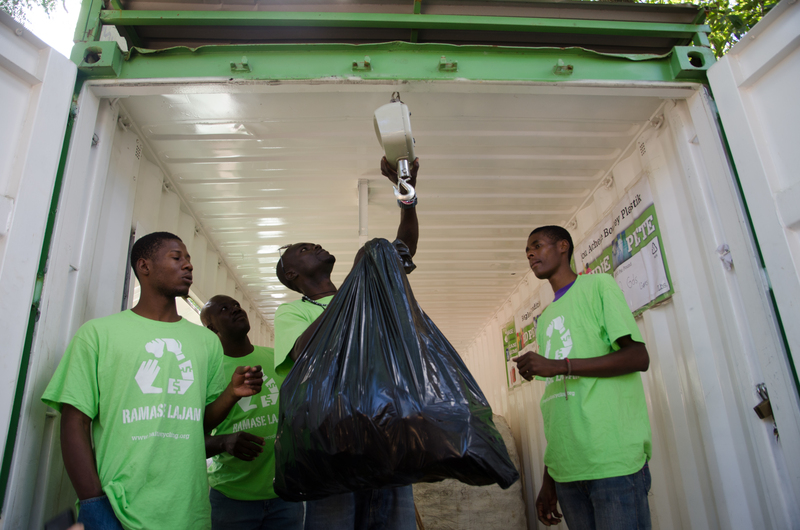 We visited a new recycling center in Haut-Du-Cap, near Cap Haitien, the first center in the north of the country. We met the Haitian manager (called the “proprietor”), Purnell. He is young and so proud of his business. Purnell and his team are now working to educate the local people, for whom the concept of the recycling center model is new, to engage them in picking up recyclable waste in the area. As this program grows, the goal is to build a processing plant in Haiti, employing Haitians to turn garbage into gold—or at least, to turn plastic bottles into useful products like shoes, bags and other plastic goods, that can in turn be sold for Haitians or as souvenirs. And in the process, build up communities and individual leaders who represent the promise of sustainable economic development and a cleaner environment for this struggling nation. The magic of this place is its people, who are so passionate about their land and their heritage, yet often are left powerless to preserve it in the face of so much hardship. Along with several of my friends and fellow travelers, I will be raising money to build a new recycling center in Jacmel, on Haiti’s southern coast. Each center is funded by donations for the materials, training and hiring of employees and initial start-up costs, totaling $25,000. To purchase handmade Reclaimed Hearts for Haiti jewelry that supports this project, visit http://www.etsy.com/shop/tohaitiwithlove. Make a donation or learn more about how you can support the Jacmel recycling center at www.experiencethevillage.com/recyclehaiti. So I’m starting to experience the usual angst about packing for my trip to Haiti in a couple of weeks. For this trip, though, I can set aside some of the agonizing over flip flops and bug spray, because I get to pack for someone else! That’s right, I’m packing a second bag full of goodies–first aid supplies, educational and art supplies and toys for the kids we’re going to meet in Haiti. It lightens the psychological load to think that this whole bag of “stuff” won’t come back home with me. And I’m so excited to gift it to children who are attending the schools we’ll be visiting or participating in art therapy programs we’re working with, as well as other kids we meet along the way in tent camps and orphanages. My bag is getting full, but if you’d like to help me stuff it with some more new or gently used kid-friendly items, e-mail me at tohaitiwithlovedc@gmail.com. Last night, I set out to experience a bit of Haiti, right here in Washington, DC. Two events offered a timely opportunity to immerse myself in the people and culture of Haiti, with just a few weeks until I travel to Haiti myself as part of the Off the Mat, Into the World Bare Witness Tour, the culmination of the 2011 Global Seva Challenge. Great timing! Photo by Keith Lane, courtesy of Studio Gallery, Washington, DC. First, we checked out an amazing art exhibition at the Studio Gallery. 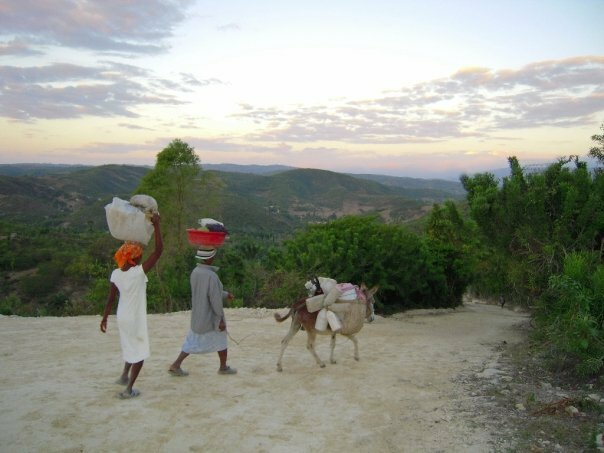 Two American artists–photographer Keith Lane and graphic artist Jenna Crowder–have created a collaborative project of multimedia art, called Ornamental Foxes, to document their travel experiences in Haiti after the earthquake. Keith and Jenna offered an artists’ talk about how they created this art, out of a desire to connect with Haitian artists and bring back a complete picture of the good and the bad in Haiti. They immersed themselves in the culture and art of Haiti, conducted dozens of interviews, took thousands of photographs, and distilled it all into a poignant representation of the people, the landscape, and the spirit of Haiti. This exhibit will be open for a few more weeks, so check it out if you can! Then, we stopped for some nourishment (unfortunately there’s no Haitian food in DC that I know about!) and headed over to Artisphere in Rosslyn, VA, for a concert by Haitian musical ambassador BelO. 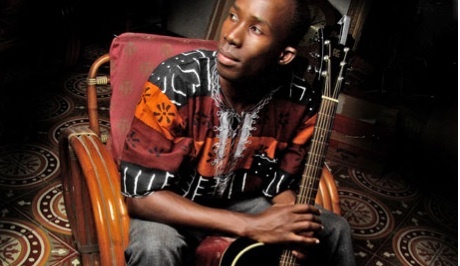 BelO is an energetic, talented, 32-year-old musician and activist who speaks and sings passionately about his home country. He played everything from reggae covers to traditional Caribbean beats and Haitian pop. Most of his songs were in Creole, but he made a point of translating and telling the stories of the songs for the non-Haitians (although it was clear there were quite a few Haitians in the room!). BelO’s most important message was one of hope–encouraging Haitians to stay connected to Haiti, to help find solutions to the nations’ challenges and tell the stories of positive change that is taking place despite immeasurable hardship. He covered Tracy Chapman’s song “Talkin’ Bout a Revolution” with such conviction that you wouldn’t doubt he meant every word. The string that rang through the whole evening was joy. 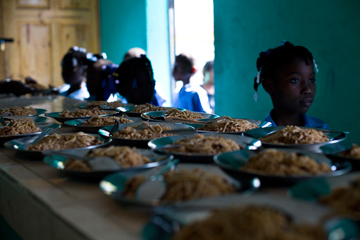 Haiti has faced what for many nations would be insurmountable struggle. Yet Haitians–those reflected in Keith and Jenna’s artwork, BelO joyfully singing about his home, and the Haitian community dancing to the beats of their history–have so much hope, a fighting spirit. 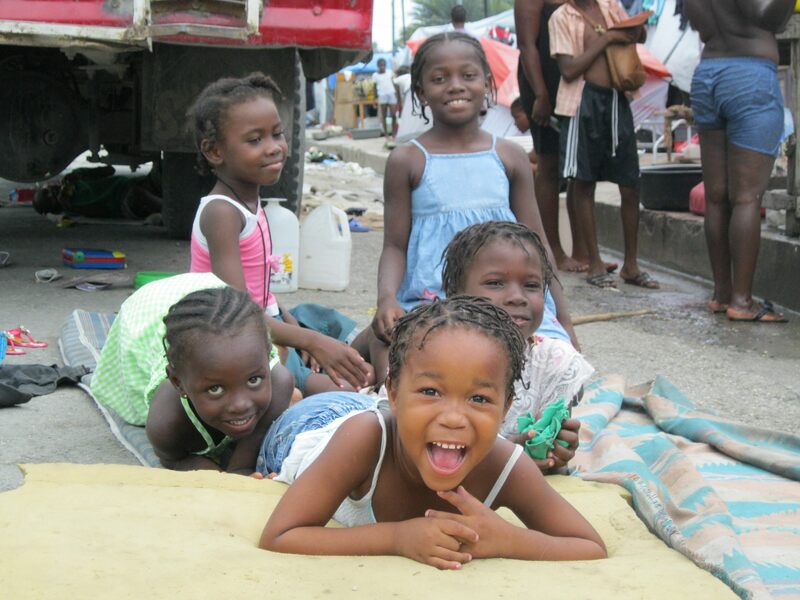 There’s no question in my mind that Haiti will recover. I am beyond inspired to document the passion of this incredible nation myself soon! We did it!!! Today officially ends the Global Seva Challenge for Haiti, and over the past eight months, we together as a community have raised more than $23,000! Thank you to everyone who purchased Malas for Haiti jewelry, generously donated or attended To Haiti With Love DC events, or helped spread the word about the cause, especially in the final weeks of fundraising. This incredible achievement would not have been possible without all of you. And we are all part of a larger community–across the country, more than 60 participants in the Global Seva Challenge collectively raised more than $300,000 for this incredible cause! On to Haiti… On February 5, I will board a plane to Port-au-Prince with a group of 10 other yogis from around the country who also successfully raised at least $20,000, along with the Off the Mat, Into the World team, including yoga teacher Seane Corn and teacher/musician Suzanne Sterling, for the Haiti 2012 Bare Witness Tour. We will travel through Haiti for two weeks, connecting with the individuals and organizations that your donations are going to support and assisting with various projects, including installing water filtration systems, contributing to the construction of a community center and children’s center, meeting and learning about the women who are receiving small business loans, and helping to remove rubble from streets and project sites. Stay tuned, I will be blogging in this space, documenting this extraordinary journey. About six months ago, I set out to do what still seems like the impossible: raise $20,000 for sustainable relief efforts in Haiti, through Off the Mat, Into the World’s Global Seva Challenge. I set out on this journey initially because I needed a project, a focus for my energy, a direction for my practice as a yoga student and teacher. I was going through a challenging time at my now-former job and wrestling with the urge to find a new higher purpose in life. I felt disconnected and disjointed and disoriented. But as I quickly began to immerse myself in the situation in Haiti, which had largely faded from my memory and the public consciousness, replaced by new disasters, celebrity gossip, and the perceived chaos of daily life, I realized that this journey was a big part of that higher purpose I was looking for. This nation, virtually in our own backyard, continues to suffer immensely more than a year and a half after the devastating earthquake in January 2010. Click over to the prAna blog to read the rest of this post about my Seva Challenge journey! 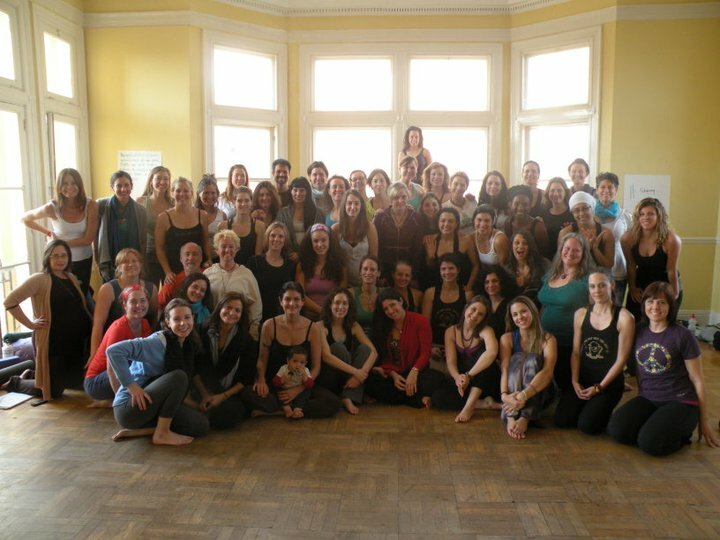 The beginning of my OTM journey, at our DC intensive back in March. I am continually filled up with gratitude for the ways in which the Global Seva Challenge and my journey with Off the Mat has allowed me to connect with people with whom I never would have crossed paths otherwise. This weekend, I headed “home” to the Philadelphia area for a family commitment. But while I was there, I dropped by a lovely yoga class taught by my friend and fellow Off the Mat leader Maura Manzo. The class, which Maura teaches every Saturday morning on the rooftop deck of a local Whole Foods store, began as part of her own Seva Challenge journey last year for South Africa. She’s kept it up since then as a community class. My sister and I laid out our mats with a bright-eyed group of yogis. In addition to the amazing sun-basked class, Maura gave me ashout-out to let her regular students know that I was there visiting and currently fundraising for the Seva Challenge for Haiti. I received some donations and sold some of my Malas for Haiti jewelry after class as a result, and received some impromptu seva mentoring and support from Maura over juice later. I am honored and humbled to be part of this amazing community of yogis and activists. Everyone I have met through Off the Mat has been an angel on my journey, shining a light on my path and lending the type of support that can only come from someone who has walked the very same path of growth and transformation.